Five years ago, I had never cooked Brussels sprouts or butternut squash, and I had never purchased, much lest massaged kale. Now all favorites, I can’t believe how long my family and I were missing out. Think about the last time you prepared a new vegetable. Unless you make a concerted effort, it’s easy to slide right into a recipe box rut. And, that’s exactly where I found myself a few months ago until I became determined to try new veggies more often. I committed to trying something new – whether it be a new veggie or an old favorite prepared in a new way – at least once a month (but ideally, once a week). One of my favorite discoveries from my “something new” endeavor has been parsnips. Not only had I never purchased parsnips (find them near the beets and other root vegetables in the produce section, I wasn’t even sure what they looked like (think large, misshapen, white carrots). Rich in vitamin C, folate, potassium and fiber, parsnips are related to carrots, celery and parsley and have a rich, sweet, and kind of nutty flavor. I first roasted them last Thanksgiving, and while they were good, it wasn’t until early December, when I planned on trying a parsnip puree and ended up over-roasting, er burning, them that this dish was discovered. 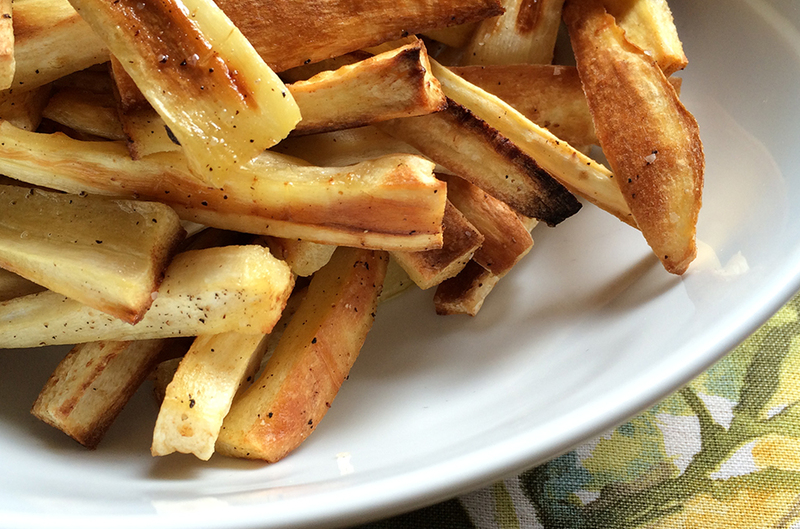 Turns out, burnt parsnip fries are incredible. I’ve prepped them several times since (with just slightly less char) and started drizzling with white truffle oil which takes them over the top. For young kids or picky eaters, you can also serve with a little ketchup. Note: I like to use avocado oil for roasting because it has a smoking point of 500 degrees Fahrenheit and thus can withstand the high temperature (I typically roast veggies at 375 or 400 degrees). Next time, I’ll try roasting them with coconut oil and cayenne, or might be going cheesy and adding parmesan or nutritional yeast. Plus, now that I’ve got the fries down, I’ll be looking for some other ways to enjoy a new favorite (parsnip recipe suggestions, anyone?). 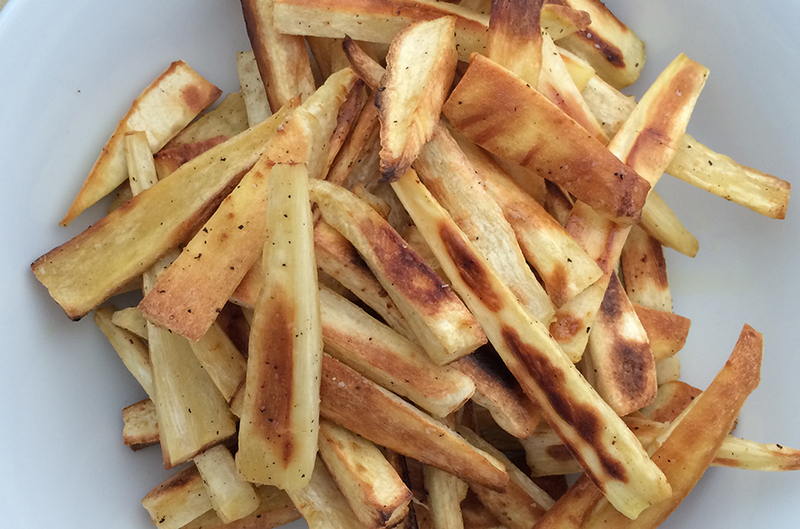 Peel, then slice medium-sized, firm parsnips lengthwise into batonnets (French for little batons). Toss with avocado oil until just lightly coated and salt and pepper and place on a baking sheet. Roast for 30-40 minutes until golden brown, turning over about halfway through the cooking process. Place in a serving bowl and toss with a small drizzle of white truffle oil (a little goes a long way). Season again with more salt, if necessary. Kids will love these - call them French fries cousins or besties!